Foreigner have been around for over thirty years and produced plenty of classic hit songs during their career and released several albums that went Multi-Platinum, so its nice to see that the band are still looking to try new things. Acoustique is as the name suggests, an acoustic album - the band's first one. As well as including acoustic versions of some of their best known songs including "Juke box hero", "Waiting for a girl like you" and "Cold as ice", there's a previously unreleased song (The flame still burns), and a cover version - That's all right (made famous by Elvis Presley), as well as a brand new song, "Save me" (which isn't done acoustically). "The flame still burns" was originally co-written by Mick Jones for the 1998 movie "Still crazy" and was performed in the movie by Jimmy Nail, and sounds great performed acoustically by Foreigner. The hits all sound really good done acoustically, proving that a really good song can handle being played in a number of different ways and that the quality will shine through. "Juke box hero" sounds great and has a nice violin solo which works really well in the song. "That's all right" stands out immediately as sounding very different to the rest of the album, and it comes as no surprise to see that it is a cover version - the song was made famous by Elvis Presley. This song stands out as being very different but its been excelently done and doesn't seem out of place on the album despite it sounding quite different. The subtle use of violin, cello, flute and saxophone throughout the acoustic part of the album really help add a bit more depth to the music and help bring the songs to life. "Save me" is one of three normal (i.e. non-acoustic) tracks on the album and is a new song written by Mick Jones and Samantha Ronson, and is a great track that would be at home on any Foreigner album. The standard version of the album is great - 14 tracks of excellent music, but the limited edition box set looks absolutely amazing - two CDs plus a live DVD. Whichever version you opt for you'll be making a good buy. 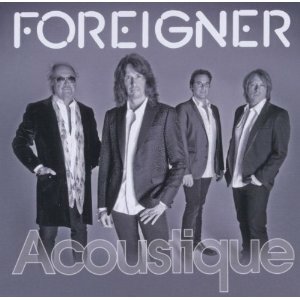 This is a fantastic album and one that all Foreigner fans should add to their collection.